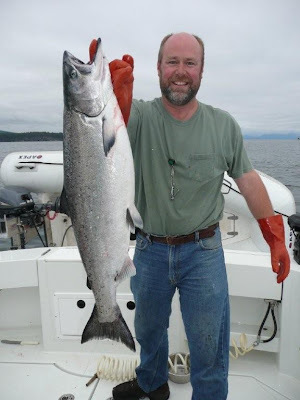 33' to Alaska: Thursday, July 16, DeGroff Bay, Something’s Fishy! 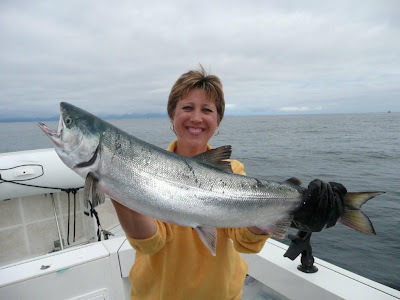 Thursday, July 16, DeGroff Bay, Something’s Fishy! Have you ever had one of those nights you just couldn’t sleep because you just had one of those incredibly exciting days and you just kept re-living it in your head? It’s 3:30AM and I am wide awake. (For those of you who really know me, I’d rather die than get up before the sun! Although, I guess the sun is already up here, or close to it.) Yesterday will go down in my history as one of those really great days and I just can’t wait to get started on today! One of the boats, a couple slips down from ours, got a radio report from his cousin that the Cohos were hitting a few miles off of Cape Edgecombe so, after we got done with our chores in Sitka and had a Subway, (wow, was that good again!) we headed out there. It was about a 45 minute beautiful cruise from Sitka until we saw the trollers out in the ocean off the cape. I’m glad to get back out in the wilderness. 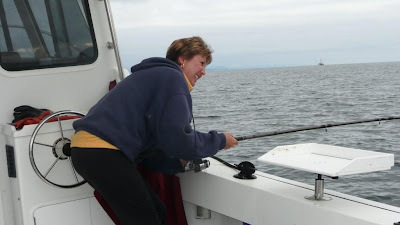 We settled smack in the middle of the big fishing boats which made Val nervous, but I wanted the best chance at catching salmon! I re-tied all my flashers and hooks according to Ken’s advice and dropped the down riggers to 60’. Within a couple of minutes we had a fish! Bummer…just another Rock Fish, but a really nice one! A couple of minutes later, we had another fish…could it be? 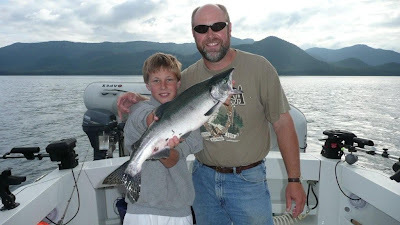 Yes, a Coho! We were all so excited. We really had a lot of action. We fished for about 3 hours and ended up keeping 2 Rock Fish, 4 Cohos, and 2 Kings! We must have lost half a dozen others and threw back that many as well. We all took turns fighting the fish while the others pulled up the down riggers and netted the fish. It was a great team effort and everyone really had a great time, except Tanner who was leashed up in the cabin. He’d have been in the water in a split second at any sighting of a fish. Boy, did he whine! He could hardly stand it; he wanted to be where the action was so bad. These are really the first ocean-run salmon we caught this year. While we appreciate the “sympathy salmon” from Ken, these were ours! We caught them! Wow! Finally! We had to wait long enough, but God answered Connor’s prayer for “lots of salmon today.” The Kings were an extra special blessing! 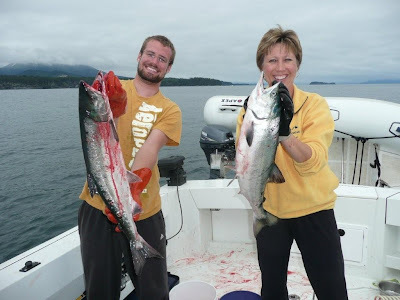 After fishing, we had another 45 minute cruise to our beautiful little anchorage in DeGroff Bay, (where we left the crab and shrimp traps on Monday,) and Val cooked dinner while I cleaned the fish. We feasted on crab and recounted the day, play by play. What a great day it was. Everyone rated it amongst the best of the trip so far. That’s my God, all right, and He is awesome! Another profound truth is found in John 15. Jesus said, “I no longer call you servants, because a servant does not know his master’s business. Instead, I have called you friends, for everything that I learned from my Father I have made known to you.” This God, who created all this and is allowing me to enjoy it, calls me His friend! Wow! How can you get your mind around that? What a great friend He has been!Well, it’s going to be a few more hours before the rest of the gang gets going, so I’m going to go lay down and re-count yesterday’s memories yet again. Make the most of your day today and don’t forget to share some quality time with your friend.